Gathering of Cabinet National Forest foresters at Thompson Falls Ranger Station, circa 1912. Granville 'Granny' Gordon on the left. Courtesy Granville and Pauline Gordon collection. During the period preceding World War I to the years immediately following it, 1917-1919, the forest service made considerable progress in the region. With memories still fresh of the 1910 holocaust fires that ravaged and destroyed so much of the timber, 1917 worried them considerably. Labor disputes changed the make up of crews fighting fire. F. A. Silcox utilized many of the striking lumberjacks and declared he'd never had finer fire-fighting crews. Fall rains began September 7, ending 68 days of continuous sunshine, the longest drought ever recorded in the valley.1. "start the work of setting out 220,000 western pine on Pilgrim creek during the next few weeks. The camp will be opened Friday or Saturday and active work will be commenced the first of next week. "It is estimated that 320 acres will be covered on this job and from 30 to 40 men will be employed under the direction of Ranger Fred Brown. The work will be rushed as fast as weather conditions permit."2. Noxon Ranger Ben Saint received a newly published bookly by Forest District 1, the Improvement Manual. It contained fifteen pages on signs and portals, written by R. H. Rutledge, Acting District Forester, March 1, 1918. Rutledge included instructions on proper signs, couched in pompous, explicit language, and included standard dimensions, size of the post, part of the tree, tin plate type signs, posters, cards and the use of tree blazes. The manual overlooked very little and included advice for rangers about dating, efficiency, forest badges, insignia, location, lettering, manufacture, material margin, paint, pencil markers, procedures, etc. Signs were to be posted. Also, advice on guiding travelers, heavy snowfall, policy, fire prevention, forest boundary, trail entrance, ranger station, etc., were set forth in Rutledge's words. "The gophers on the Noxon ranger station are getting discouraged. The ranger is feeding them all the poison they want and shooting at the ones that won't eat it. It works fine."3. Ben F. Saint and his wife, Fern, and their growing family lived in Noxon in very humble quarters, compared to the tidy headquarters he'd transferred from at Trout Creek. Even his man, Walter Lake, enjoyed finer accommodations. 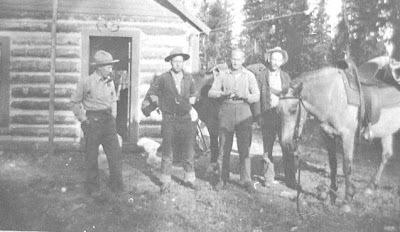 Lake and his wife, Lula, left their own subsistence-level homestead on Bull River to work for the forest service. "In 1919 we moved into the Bull River Ranger Station so our children could go to school at the Pilik school," Lula said. "Bed bugs were ferocious."4. Miss Alice Turtle, a school teacher living in the Pilik schoolhouse, asked to come live and board with Lakes, paying them $40 a month. "The school was a mile, a long mile, south of the ranger station," Almeda Lake said. "The first year my brother, Stanley, was in the 8th grade and we usually walked together with the teacher. At least, we started out together. They were soon ahead of me. "Stanley went to school in Noxon the next year, staying with Grandmother Ellis. But a family moved in the log cabin just south of the Rangers station. They had children, too. "There was no indoor plumbing and we carried the water to the ranger station from a creek on the north. We had our washstand just inside the back door on the left. It held the water bucket with dipper, and a washbasin. "Another bucket stood underneath for waste water. A small mirror was over the top of the stand. To the right, going in the back door, was the pantry and stairway. The pantry was used to store food that wasn't put in the root cellar. Also, there was storage under the stairway. The stove may have been a Monarch. It had a water reservoir on the right end as you faced it; the firebox, on the left. On washdays mother heated water in the boiler on top of the stove. This boiler also served as a canner. "She used lye as a bleach occasionally but she boiled the white clothes to keep them white, scrubbing them on a wash board. In summer the tubs were outside but in the winter she washed in the kitchen. "The kitchen chairs were kept pushed in around the table on which we always ate, played cards, and used as a work table. "Mother always fed any of the forest service men and others who stopped by. The adults were served first when there was company. My brother, Stanley, and sometimes my father, hunted. Dad had a 30-30 they used to kill deer. Mother canned the venison in quart jars, processing for several hours a boiler full of jars, immersed in water. Vegetables, too, were canned this way. The kitchen stove kept the headquarters hot on summer days. "Stanley also fished a lot and what wasn't eaten fresh, mother canned, too. Wood was our fuel. Stanley and Dad cut the wood and carried it in. Later Dale helped some, but he was small. "We always had a big garden and we all worked in it. A lot of the produce was canned and what wasn't was stored in the root cellar or buried. We raised LOTS of beans, cucumbers, pumpkin squash, tomatoes, peas, carrots, cabbage, potatoes, onions, corn, Swiss chard and I think, lettuce. "The staples were bought in large amounts. We didn't go to town too often in the winter. When we did, we loved the sleigh rides. "The winters were cold but we had warm clothes and we had blankets around us and some kind of foot warmer if we went far. "We had a team of horses and two cows. Each evening Stanley or I would have to go to the pasture to bring the cows up. We raised a few pigs. We bought most of our hay from Marion Cotton, who lived up the road a ways. "We always had chickens for eggs and meat. Lots of milk, cream and butter. One of the highlights of the 4th of July was fried chicken. We also had new potatoes and peas creamed, and home made ice cream. Of course mother canned chicken for winter. "In summertime we went berrying. We picked raspberries and blackcaps for eating fresh and for jam. We raised strawberries, but there were wild ones, too. Huckleberries were plentiful. Mother picked and canned gallons of them. Using them for pies, sauce and other ways. We sold what we could. "Mother made my clothes and hers on an old treadle sewing machine they acquired. She never had a pattern; she made her own or just cut it out "by guess". She really was very clever. I can remember many compliments on my dresses. "The next teacher was Miss Albertine Waylette of Plains. She stayed the one term with us and then Miss Florence McDonald from Eddy came the next year. Following her, Miss Agnes Sand of Whitepine came. By this time I was taking 3rd and 4th grade. "We sometimes had programs and dances at the schoolhouse. We got together at friends houses once in a while. We had a telephone. A few other people along the river had one - party line, and there was some "listening in" done. Often times messages would come to us to be delivered to neighbors without phones."5. Some summers Walter was lookout on nearby Squaw Peak, and then worked with the tree plant crews in the fall, where he was a cook. He was gone from home a lot. "Winters were very cold and deep snow," Lula Lake said. "But somehow we got by and the children loved the snow."6. The forest service was in full summer activity by July 1919. Ranger Saint and Walter Lake made a trip to Squaw Peak one Wednesday taking Mr. Wing up to the lonely rocky peak, installing him for a summer of "watching for smokes."7. Dan DeLong began building a house in Noxon for Ranger Saint. On the bench south, and a few hundred feet east of Buck's house, it would be the largest and loveliest house in Noxon. The house was to have a cement basement, two large bedrooms, bath, living room, dining room and kitchen on the main floor and an upstairs. Saint and his wife, Fern, watched it grow, anticipating their move from the barren rooms at the rear of the long frame forest service office building they'd called home the past two years. Government funds filtered into the economy the summer of 1919. Fires were serious and costly. Six men were arrested, suspected of setting a fire on the divide above Heron, causing the employment of 100 men to fight it on the Idaho side. The cases was dismissed, for the reason that nothing definite could be obtained against the men except that they were near the place, having been engaged in fighting the fire, and were later heard cussing the government and the Forest Service. The fire season depleted all the funds that year so that by October there were no funds left to pay bills until Congressional action could be taken to relieve the situation.8. If fishing wasn't the primary reason most people settled in the mountains, it was enjoyed by nearly everyone, to one degree or another. The Northern Pacific Railroad, with thousands of acres of land to sell, saw to it that enticing publications were circulated. Fishing and hunting were high among the things they praised in Fishing and Hunting On the Headwaters of the Columbia in Northern Idaho, a 1915 publication they circulated widely. "After packing five miles over road and trail (from Noxon) we came to an old cabin on the bank of Rock Creek ... using a Queen of the Waters fly, caught fifteen beautiful trout. Rock Creek proved to be very much alive with trout, although not very large ... a fine school of Dolly Vardens right where the creek flows into the Clark Fork River, feeding near the bottom. "Caught two by casting a spoon across the creek's mouth, letting it sink, then reeling in rapidy. Over 5 pounds each. The cutthroat trout (salmo Clarkii) is the leading game fish. Requires a Royal Coachman, a Cowdung, Grey Hackel, Black Gnat, Professor or Queen of the Waters to coax them. People who read the stories learned, "The Dolly Varden trout (Salvelinus parkei) is the largest trout. This char is not at all, or at least transiently, migratory. In August individual specimens may be found in the streams and an occasional one follows the trout migration in the spring, but in general the larger specimens are to be found in the lake where they remain during the entire year, spawning in the shallows over sandy bottom. "It is the most voracious fish known, and as it is so many pounds of greased lightning ... squaw fish dart in every direction when one comes gliding through the clear water. They also strike hard and are some scrapper when attached to a spoon or live minnow. "Silver trout", a yearly run in June. Are always large, averaging from two and a half to six pounds or over. Are very hard fighters and are a variety I have never seen elsewhere."9. Somehow, homesteaders didn't have quite the same viewpoint as the railroad. For quite some time they'd appealed to the state to enhance the fishing. They used the war in their pleas for what had earlier been unavailable; planting fish would also serve the patriotic efforts. Patriotic or not, their wartime cry, "Good fishing cannot be allowed to become depleted," didn't produce results for over two years, and 'Sculpen' fish were caught in Blue Creek on bait in 1918-20. The U. S. Bureau of Fisheries promised to send a supply of fish fry to stock the steams. And eventually the weekly newspaper was able to inform its readers. "Notice was received the first of the week that the state fish car with fry for Plains, Thompson Falls, Whitepine, Trout Creek and Noxon was due to arrive Wednesday, but instead of receiving the stock a message was received that the car had broken down so that the shipment could not be delivered. "The application for the stock was made about two years ago, and as this was the first recognition of it, the local fishermen were naturally considerably disappointed at the turn of events. An effort will be made to secure a shipment from the state hatcheries at a later date as the fry is badly needed in the streams of the county." The State Fish and Game Department put fish fry in streams July 1918 and Bob Saint said his dad, Ranger Ben, brought a ten gallon can of Native Trout fingerlings in 1919.10. About this time, Jack Pilik's Bull River neighbors were leaving. Fishing was a contributing factor to giving up her homestead. Weare tells the story. "A widow woman with three boys and a girl took up the place next to Pilik. She was from Helena, too. Come with Piliks. "Of course she couldn't do nothing alone, she couldn't clear no ground. The Pilik boys helped her build a house. Put up the logs, you know. Her kids, all they wanted to do was fish. There was lots of fish in the river, you know. "They'd been down and got some fish, the boys. She said, 'You clean 'em.' "So the boy was outside cleaning them. They had a little dog. The boy stood there with a knife in his hand, and the dog jump up agin him and he stabbed himself in the eye and put his eye out. "That discouraged the old lady. They moved off, didn't prove up on their homestead. Pilik did. But not the others."11. window. Courtesy Clayton Bauer collection. It wasn't surprising to many readers that at least one person would have his say in the weekly newspaper on the matter of fishing, and at least a few chuckled, but the old-timers share H. D. Jackson's sentiments when they read his Letter to the Editor, in the Sanders County Independent Ledger, July 17, 1919. "Letter to the Editor", H. D. Jackson. "I would like the space in your paper to ask every citizen of Sanders County who is interested in fishing to take the trouble to kill every snake that they see. Hardly anyone thinks about it, it is a fact that the little striped snake catches more fish than the fisherman. "I don't fish much myself but I hardly ever go without finding at least two or three snakes with fish in their mouths. I believe there should be a small bounty put on snakes and a larger one put on hawks. "When I first came to the country the squirrels were so thick that we used to shoot them by the hundred for sport. The hawks, coyotes and weasels lived on them and there were plenty of birds and rabbits. For the past five years there were not many fish, birds or rabbits killed as there were before. Yet they are continually growing less. "The seasons have something to do with the amount of game but I know that the snakes here are busy all the time and they don't eat anything else while they can get little fish. "The hawks and coyotes will not let the birds and rabbits alone while they last and the weasel will take a rabbits trail and they don't stop until they have caught him and sucked his blood. "Another animal that is a great nuisance is the mountain lion. There are a few left back in the hills that live on deer. They like the fawns best and there are places where they just about cleaned them out. "The government is employing men to hunt these pests and I don't see why this part of the state is not entitled to one (government hunter) part of the time. But in the mean time until we get one we can each kill a snake when we see one and as many of the others as possible." Somehow man can never be satisfied with his environment, it seems. One way or another he's always tinkering with it as though it was a machine able to be fine-tuned. The newspapers kept its readers apprised of the activities their neighbors pursed. "James Duffy of Noxon who claims to be a scientist on trapping bear, hasn't been able to get any salt on old bruin's tail yet. The bear family knows him and seem to watch out for him as he is well advertised among that race."12. "Several men have traps out for bear, though there are signs of only a few out of winter dens, there still being snow on the shady side."13. "A "silver-tip" bear was killed by Harmon Dove on Canyon Creek, a tributary of Vermillion. A number of hunters have been fortunate enough to kill bear while the hide is prime. 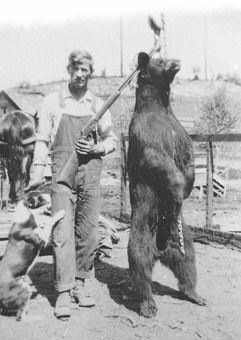 One fine specimen of black bear weighed nearly 300 pounds and had a splendid pelt."14. "John H. Brauer, timber estimator for the county recently was treed by a silver-tip bear while engaged in his work. He is now carrying a .44 Colt to protect himself from further attacks."15. Jim Berray, Jim Freeman and C. C. Hanson at Noxon were among the two dozen gopher exterminators appointed by the county commissioners in 1920. By fall, the settlers discovered that the war waged on gophers with poison had also killed the grouse. Few were left for hunting.16. Man is ever the tinker with his environment, yet never the master of it. Sanders County Independent Ledger, September 13, 1917. Sanders County Independent Ledger, May 6, 1918. Lula Lake, letter July 3, 1973. Almeda Lake Green, letter, November 7, 1989. Lula Lake, letter, July 3, 1973. Sanders County Independent Ledger, July 17, 1919. Sanders County Independent Ledger, August 21, 1919. Fishing and Hunting on the Headwaters of the Columbia in Northern Idaho, (c) 1915 by Northern Pacific Railway Co.
H.R. Bob Saint, tape-recorded oral history, November 18, 1983. Clifford R. Weare, tape-recorded oral history, June 28, 1973. Sanders County Independent Ledger, May 13, 1920. Sanders County Independent Ledger, June 10, 1920. Sanders County Independent Ledger, July 1, 1920. Sanders County Independent Ledger, September 9, 1920.